We’re kicking off the Espresso Subscription with one of the most celebrated roasters in the world: Tim Wendelboe of Oslo, Norway. Tim Wendelboe (owner & founder of the self-titled Roastery) has a passion for sourcing quality green coffee that has translated into Tim Wendelboe working closely with producers across Central and South America in order to innovate and improve the quality of the coffees he buys. Tim is known in the specialty coffee community around the world for his lighter approach to roasting and his affinity to single origin coffee. He won 1st place in the Nordic Roaster Competition in 2008, 2009, 2010, 2015 and 2016. He has also won various Barista and Tasting Championships. We couldn’t be more excited to start off the Espresso Subscription with such an incredible roaster. Growing Conditions: 1650 – 1750 masl. In full sun. This coffee is selectively hand-picked by hired pickers under supervision of Elias Roa. Cherries are hand-sorted before they are processed to make sure only ripe cherries are processed together. After depulping the parchment, the coffee is rinsed in clean water. Then the water is drained and the parchment is fermented for 14 to 16 hours. After fermentation the coffee is washed in clean water that is changed 4 times. All ﬂoaters are removed during the washing. The Parchment is soaked for 24 hours in clean water before it is dried in parabolic dryers under shade from 25 – 35 days. “We started working with Elias early 2012 and did our first harvest together in May – July 2012. Since then we have been working hard, every harvest, in order to improve the infrastructure at the farm and of course improving the farming and processing practices. For each harvest the coffee quality has improved and become more consistent giving a very clean and sweet taste in the cup. This is our biggest project with a single farmer so far and if you want to learn more, we have published a book about all the changes and progress we have made with Elias and his farm. 1. 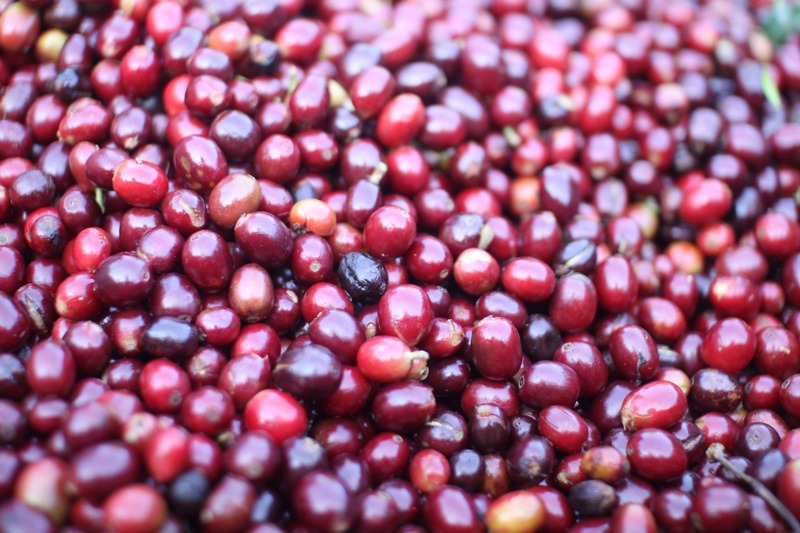 Improved the picking and implemented sorting of all cof- fee cherries before it is delivered and processed. The pickers are paid a lot more in order to do a more selective picking. We have also built sorting tables so that the pickers don’t have to sit on the ground while sorting the cherries before they are delivered for processing. 2. Improved and cleaned up the wet process in order to make sure the product is clean. 3. Improved the drying process by drying the coffee in shade for 30 – 40 days instead of the normal 6 days. This helps keep the coffee fresh for a lot longer. 4. Improved logistics and storage by storing the coffee in cooler climates. 5. Improved the milling of the coffee. We are now separating the different screen sizes within a lot in order to make a more uniform roast of the coffee. Check out the video below for an immersive look inside Finca Tamana.